It’s time again for the very best reason to stay inside with your eyes glued to a screen in the middle of summer. 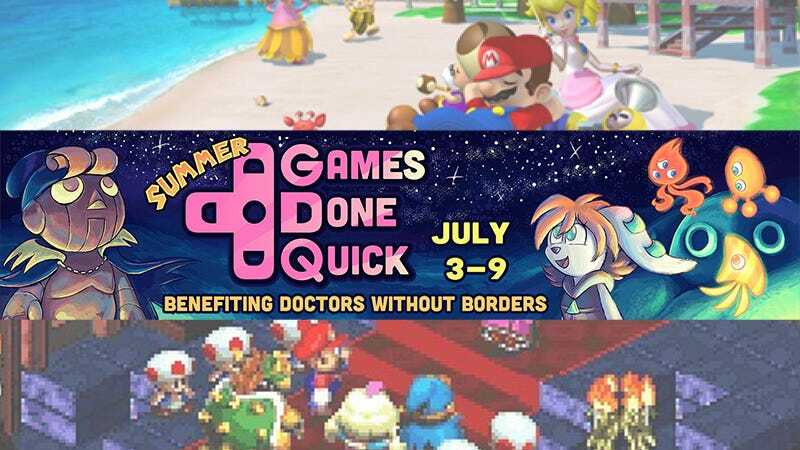 The best speedrunners in the world gather for Summer Games Done Quick, a nonstop seven-day speedrun marathon benefiting Doctors Without Borders. If you’ve not been watching you’ve already missed two days of amazing runs, but you’ve still got a lot of goodness ahead of you. This morning we’ve got the Castlevania block. Later today, indie games. Then on Wednesday my fav0rite part of the event, the Disney game block, with Sonic the Hedgehog leading up to it. Here’s all of what’s going on Tuesday and Wednesday. (click on the images to enlarge). All times are Eastern. Check out the website for the full schedule.